Would You Like To Work Less And Earn MORE? If you've been marketing online for any length of time, you probably already know this. Affiliate marketing is a GREAT way to make money. It's how I made my first dollar online, and years later it's still where a big chunk of my income comes from. For those newer to this game, what is affiliate marketing... and what's so good about it? It's a very simple model - and simple is good. If you - like me - have bought countless 'never seen before' breakthrough systems to make money online, only to be disappointed, confused and let down, you'll appreciate the beauty of a simple system that actually works. Someone else creates a product and sets up a website to sell it. You, as an affiliate, promote that website and send traffic to it through your own unique link. If any of the visitors you send buy the product, you get paid a commission. The beauty of it is you do not have to have a product of your own, you do not have to deal with product delivery, handle customer enquiries, complaints or refunds. In fact you do not even have to have a website. No other business model has such low barriers to entry. Start up costs are virtually zero, and you can start making money in a very, very short time. See, one of the biggest problems affiliate marketers face is the constant need to drive traffic to the offers they promote. A good proportion of the visitors you send will not buy, and for the ones that do, you get paid once and then have to continually go get new traffic to keep the money coming in. Smart marketers find ways to do this but truth be told, it can become a bit of a treadmill. And once you stop sending that traffic... your commissions stop dead too. But there is a way that the really smart marketers use to explode their affiliate commissions, without the need for any extra traffic. A way that you can keep getting paid month after month - even if your traffic does tail off. 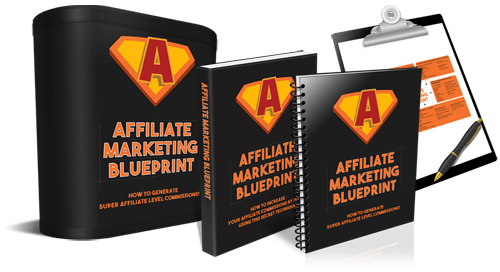 What you're about to discover can instantly catapult your affiliate commissions to a new level - without the need for any extra work. And like all good ideas, it is stupid simple. The one thing that's even better than selling affiliate products is Selling Recurring Commission affiliate products! Just think about this... Wouldn't it be great if you could promote ONCE but get paid month after month, like clockwork, without putting in ANY extra effort? The simple fact is that it takes the same amount of time and effort to promote a product that pays you just once as it does to promote one that pays you recurring commission month after month. If you truly wish to attain freedom, you really need to start generating genuinely passive income for yourself. Traditional affiliate marketing with one-off payment products cannot do this... the amount you can make is directly tied to the amount of work you put in. Now, it sounds pretty much like a no brainer... do the same work, get paid once OR do the same work, get paid repeatedly. And it is... but that really doesn't do justice to the true power of recurring products. To show you what I mean, let's do the maths. Say that we're promoting a $47 product as an affiliate, and you earn 50% commission - so $23.50 for every sale. Let's say you send 1000 visitors a month to an affiliate product - that's about 30 visitors per day, very do-able. Now let's say you get a 5% conversion rate (meaning of every 100 visitors you send, 5 will buy). So every month you sell 50 products (5% of 1000) and earn $23.50 X 50 = $1,175 - or $14,100 in a year. But let's say you promote a different $47 product on Clickbank, this time with a recurring monthly membership also at $47 (again, 50% commission). 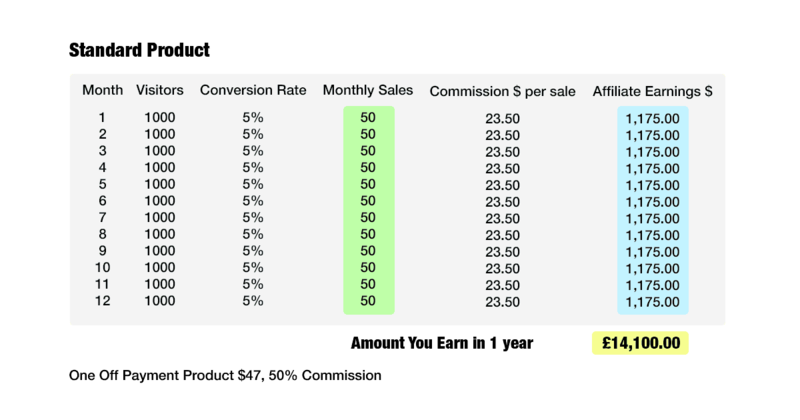 You send the same 1000 visitors per month, get a 5% conversion, so your total earnings in month 1 are still $1,175. In month 2 you send the same amount of traffic, so make another $1,175.... but you also make up to $1,175 from LAST MONTH's traffic! Even if we allow for a drop off rate of 10% (as members leave), you'll still earn an EXTRA $1,057.50 - so total earnings in Month 2 are $2,232.50! And that's just month 2 - this just keeps on growing. Keep this up, and over the year you'll make $64,507.50! Can You See The Incredible Power of Recurring Commissions? So the question is, Where do you find these recurring products to promote? There is no simple answer to that. It's just a case of manually searching through all the affiliate networks, looking for products with recurring commissions, checking out the sales pages, going through all the stats - conversion rates, refund rates, EPCs... and lots more. takes a LOT of hard work... weeks if not months. 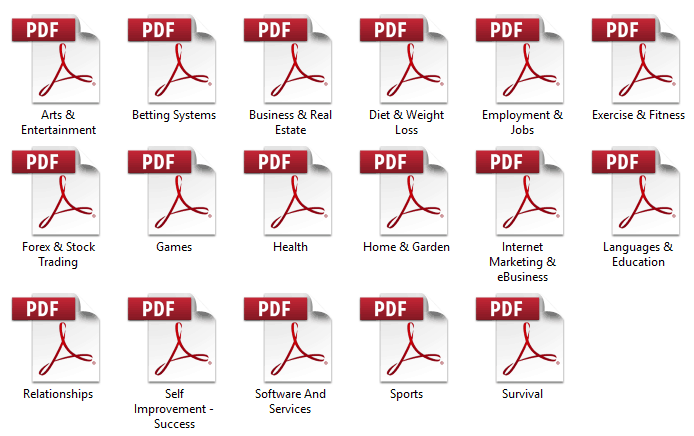 If you've ever tried to use the search feature in the Clickbank Marketplace, you'll know exactly what I mean. You'll receive 17 separate lists containing over 250+ RECURRING COMMISSIONS affiliate programs In 17 Different Niche Categories. These products are researched MANUALLY and are 100% UP-TO-DATE! All these products are listed in Clickbank, so even if you're just a beginner, you'll have no issues getting affiliate approval. And unlike some affiliate networks, you're guaranteed to get paid - ClickBank is one of the most visited and trusted sites on the net, and has never missed a payment since they started in 1998. Their proven tracking and payout process means that you get paid for every sale. Some of these programs may pay out recurring commissions on the backend instead of the front end, many of them have multiple backend offers as well as the monthly memberships. And some of the programs also allow you to earn recurring commissions on MULTIPLE products... Some even lifetime commissions! We've went through every product on Clickbank, discarded the ones with poor sales pages and low commission payments, and selected ONLY The Highest Paying Affiliate Offers. Every One of the 250+ affiliate programs has AT LEAST $50 average rebill - this is the average amount an affiliate makes on all of the rebilled sales - this number doesn’t even include the initial sale amount, that's extra! The top paying product has an Average Rebill Total of $2,229.22! That means you as an affiliate earn an incredible $2,229 for every customer you send! If you seriously want to make big money online and maximize your earnings, then promoting products with recurring subscriptions is a MUST. Stop settling for measly commissions and skyrocket your affiliate commissions with the same amount of effort with this GOLDMINE! Your satisfaction is assured through our 100%, no questions-asked, iron-clad money-back guarantee. If you do not feel like you've received over TEN times the value for the price you paid for this information, I don't want your money. If for ANY reason, you aren't satisfied (in fact thrilled!) with your purchase, just contact me within the next 30 days and I'll refund 100% of your purchase price. When you take a look at the time and effort that went into this, and the value of what you're getting here, you can see how it would be perfectly reasonable for me to ask for $97. With this information, you'll easily be able to make that back again month after month. This is an introductory coaching video to assist you more on understanding of how affiliate marketing works. This will give you a great grounding, so that you can start to work it out your own affiliate business with a proper plan, the right tools, and the right mindset! In this video you will learn you how to choose the best products to promote, how to determine an affiliate program's profitability, and how to find and navigate different marketplaces. Words can play magic. In this module, you will learn how to write a clear, simple and yet effective review regarding the products. You can pull in a massive commission for every deal you have sealed through your “magical” review! This module will teach you the secret to double your commissions (or more!) by using bonuses to give those sales an extra boost. This is the first step to becoming a super affiliate! You will learn the methods needed to generate 5 figures per month and upgrade yourself to a Super Affiliate! It's not just about the money... becoming a super sffiliate means that you have built your credibility in the business, and opens up doors like you wouldn't believe! Good affiliate marketing is based on generating traffic, and building a mailing list. This video teaches how to generate traffic by using solo ads and look for prospective buyers who are in the same niche or market. 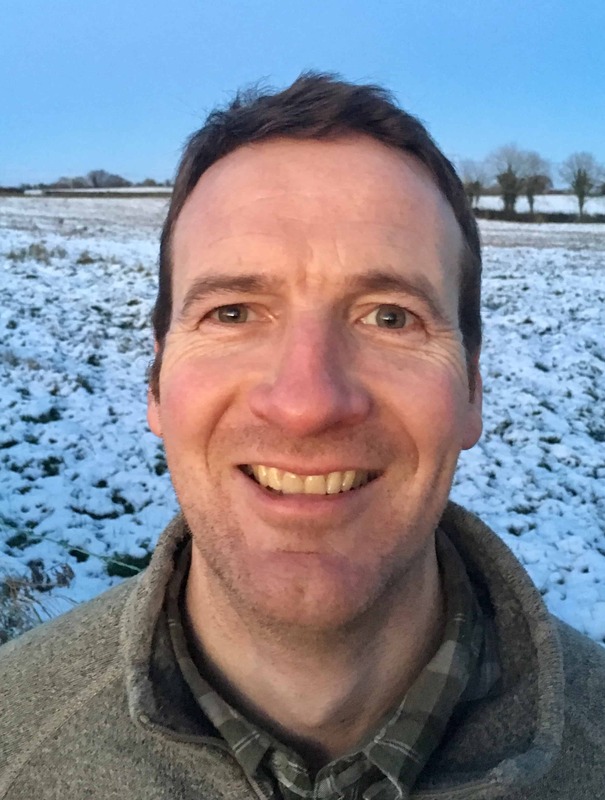 This is a paid video training course that normally sells for $27 and it will really kick start your affiliate marketing business - the perfect complement to Affiliate Rebill Riches. Purchase today, and you get it included FREE. Be a Smart affiliate marketer, start making extra money with NO extra work. 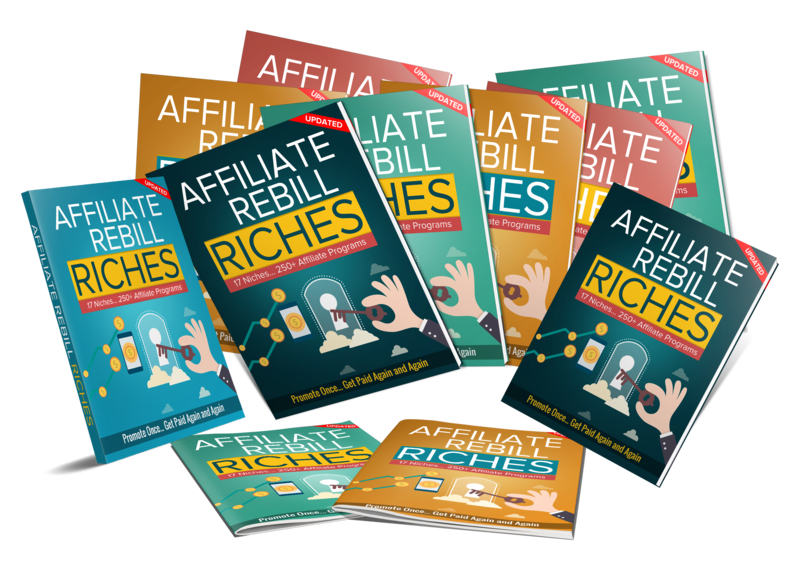 Click the button below and you can instantly download your copy of Affiliate Rebill Riches and your bonus training, right now. PS: Remember, you've got absolutely nothing to lose. 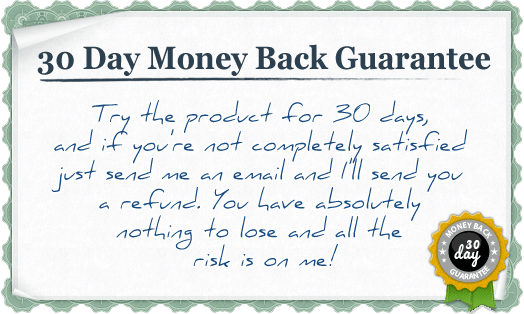 With my 30 day money back guarantee, your (very small) investment is completely risk-free. And you may not see this offer again - take advantage of this special one time price and get your copy now when you can... and work smarter, not harder.